"No scholar of this generation has had a greater fire in his bones for communicating the word of God than Walter Brueggemann. These essays on Jeremiah exemplify his insistence that criticism should lead to interpretation, and remind us again why prophets like Jeremiah still matter in the 21st century." "Like Fire in the Bones is a gift to the churches and to anyone interested in prophetic literature with its harsh rhetoric, blazing visions, and demanding yet merciful God. Jeremiah may have had fire in his bones, but Brueggemann sets fires with his pen. He shows how Jeremiah speaks into the abyss of historical catastrophe with speech that matches experience. He underlines the disputatious political character of theological speech. He reiterates Jeremiah's call to covenant loyalty even in the face of religious and government forces that suppress and silence words of life. He illuminates Jeremiah's bare-boned hope for a world in the thrall of empire and social amnesia. If ever there was need for imaginative rereading of Jeremiah and of the texts of common life, it is now. At this, Brueggemann is a master." "Jeremiah, the longest book in the Bible, is neglected much too often by preacher and teacher alike. That neglect is due, in significant part, to the prophet's often-sharp words that strike too close to home, in his own generation and in ours. It is telling that the prophet Jeremiah, the focus of these essays that span much of Walter Brueggemann's prophetic ministry, has been in his head and heart for such a long time. Again and again, Brueggemann's own words have mirrored Jeremiah to us, and the times in which we presently live could profit from hearing them again." - Publisher These landmark essays on the prophet Jeremiah allow us to hear the prophet's voice as an urgent message in our own day. The contents include: Listening for the Prophetic Word Jeremiah: Portrait of the Prophet The Book of Jeremiah: Meditation upon the Abyss Recent Scholarship: Intense Criticism, Thin Interpretation Jeremiah's Use of Rhetorical Questions An Ending That Does Not End Theology in Jeremiah: Creatio in extremis Next Steps in Jeremiah Studies Hearing the Word in Exile The Prophetic Word of God and History A Second Reading of Jeremiah after the Dismantling A Shattered Transcendence: Exile and Restoration A "Characteristic" Reflection on What Comes Next Haunting Book--Haunted People Carrying Forward the Prophetic Task Prophetic Ministry A World Available for Peace God's Relentless "If" When Jerusalem Gloats over Shiloh Why Prophets Won't Leave Well Enough Alone. 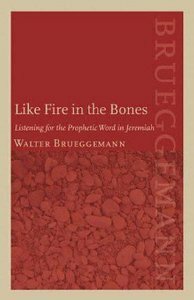 About "Like Fire in the Bones"
These landmark essays on the prophet Jeremiah allow us to hear the prophet's voice as an urgent message in our own day. The contents include: Listening for the Prophetic Word Jeremiah: Portrait of the Prophet The Book of Jeremiah: Meditation upon the Abyss Recent Scholarship: Intense Criticism, Thin Interpretation Jeremiah's Use of Rhetorical Questions An Ending That Does Not End Theology in Jeremiah: Creatio in extremis Next Steps in Jeremiah Studies Hearing the Word in Exile The Prophetic Word of God and History A Second Reading of Jeremiah after the Dismantling A Shattered Transcendence: Exile and Restoration A "Characteristic" Reflection on What Comes Next Haunting Book--Haunted People Carrying Forward the Prophetic Task Prophetic Ministry A World Available for Peace God's Relentless "If" When Jerusalem Gloats over Shiloh Why Prophets Won't Leave Well Enough Alone.